Ideally located, all facilities, well decorated, large balcony, entirely renovated, recreation area (table tennis, gym facilities, swings, table games), in the countryside, near Girona Airport (15km, Ryanair). A perfect house for families. We stayed here for a week - we were two families with three children between us. The place is absolutely ideal for children, there is so much for them to do - swimming pool, trampoline, swings, football goals, volleyball net, basketball hoop, a huge garden (more like a field!) for them to run around in. The garage, which is the entire ground floor of the house, is enormous, and is a paradise for children! There's table tennis, table football, pool, ride-on toys and so much more. There's even a sauna, though with the heat of the summer this wasn't something we used! The owners really have thought of everything a family might need. The house itself is really well equipped, at no point was there anything we needed that the house didn't have! It feels like a home rather than a holiday house, which was exactly what we wanted. The temperature of the house is excellent. There is air conditioning throughout, and it was a particularly hot week when we were there, but we were always totally comfortable in the house. The location is great, as there is easy access to so many beautiful places in Catalonia. We visited Figueres, Banyoles, Cadaqués, Palafrugell, all of which are an easy distance away. It's true that the house is situated close to a main road, but the property and grounds are well sheltered by tall trees and it is totally enclosed with a strong, sturdy gate at the entrance to the property. Inside the house, there is no noise from the road. All in all we had a great holiday here and would gladly return another year. We were all disappointed to come home and get back to reality! We are very thankful about your review. Every year we try to improve our house and make it more confortable for our costumers. When we succeed we feel specially happy and proud. We know how importants are the summer holidays and we always work hard to accomplish our costumer's expectations. We wish you a good going back to the rutines and we wish to see you by our home again. We were looking for a sunny holiday in the winter time and Girona proved to be a great destination. The villa was clean and well equipped as a family of 8 this was an ideal place for our needs. 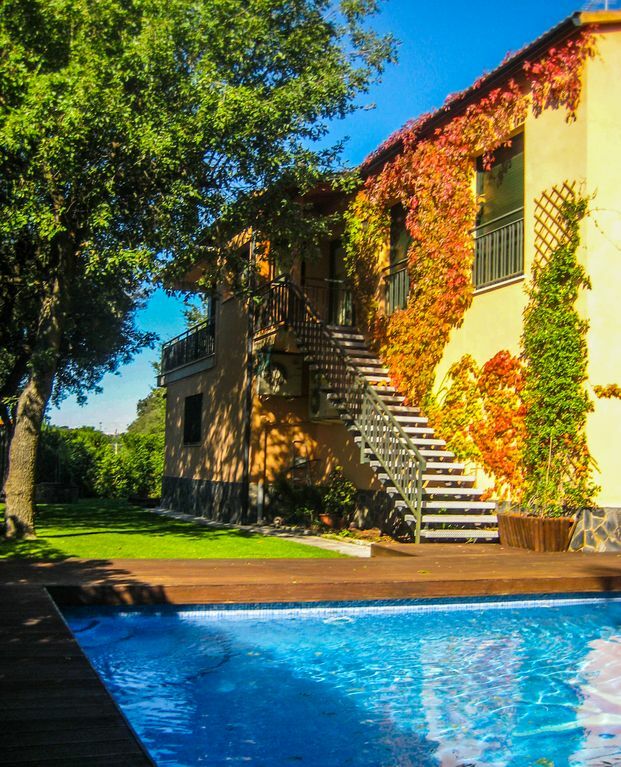 This villa is well situated for all your day trips, just outside the town so you are in the countryside yet closer enough to visit Girona's old town. The helpful owner explained everything we needed to know and helped out in every way. The villa is very spacious and very clean and it was everything we wanted and more. The garden and grounds are very private and well looked after. This house is on a very busy main road with constant traffic, and in accordance with the contract which states that you must speak within 48 hours of any problems, we told the owner that we felt that the description on the website, did not make it clear how noisy this property was and renegotiated the price within half an hour of arriving as we knew that we were unhappy with its position. However, when we came to leave, the owner refused to return our deposit and did not even look around the property which we had left immaculate with nothing damaged - in fact, cleaner and more welcoming to the incoming guests than had been the case for our arrival. In Girona, nothing is open on a Sunday and arriving late on a Saturday, it might have been nice to have at least left a pint of milk. We left some fruit, veg, drink, milk and provisions for the family who followed us. The house itself is OK. It's tired and the crockery is mostly chipped and nothing matches. TH BBQ was good once it had been cleaned by us. The pool was nice but right by the road so impossible to listen to music or chat quietly to your family. There is a nice upstairs terrace but we never sat there as you overlook the road which is NEVER quiet. You cannot sleep with the windows open! The beds do not have top sheets but empty duvet covers. The air conditioning is good if you turn it down to cool but the wifi is not great and you can't stream anything. All in all, you feel they are in it for the money and take no care to make it nice for the families who go there. We took the keys in protest when they did not return our deposit, more out of frustration than anything else, not that it gave us our money back....... It was such a shame as the area (if not the village itself!) is beautiful with lovely mountain walks and coastal villages. In all 10 years that we've been offering our house, we've never challenged a review because we feel that guests should have the right to give their honest opinion as it's always a gain that helps us improve. Criticism is one thing, but manipulating the facts is a different story. Whenever we answer a request we ALWAYS provide the exact google coordinates and encourage people to check the area on street view. We ALWAYS tell the truth as it would make no sense to say that there is 1 car every 30 minutes and then have people come over and be disappointed. Moreover, there are many reviews about the house, which also are a good indicator of how the property is. Besides, the house has insulated windows, it´s surrounded by bushes and trees, and the BBQ and pool areas are behind the house, on the opposite side of the street. On the other side, the family arrived at the house before 6:45pm. The grocery store in Quart (1 km away from the house) is open until 8:30pm and the grocery stores in Girona (5km away from the house) are open until 9:30pm. So they had plenty of time to go shopping. Claiming that we knew about their late arrival and that we did not have the decency to buy any food for them, is not true. Whenever guests are scheduled to arrive at night, we are happy to do the shopping for them as we've done many times in the past. As for the complaint about the blankets, with temperatures over 30 C, it makes no sense to put blankets on the beds. However, they are in the wardrobes at our guests' disposal. Regarding the crockery, we only have 2 options: either we charge guests every time they break something or we kindly ask them to replace it. Most customers prefer to buy a replacement. Nevertheless, every once in a while we do a major overhaul and replace everything with new crockery in order to have matching glasses and dishes again. Another important fact is that we offered them the possibility to stay in our house until they would find another place and just pay for the days they would stay without incurring any penalties. Although there were many similar properties available in the area, they decided to stay for two weeks but wanted another major discount (they already got one upon arrival) and threatened us with a bad review. Last but not least, they refused to return the keys to us when we did not accept their conditions, which is why we had no choice but to keep the diposit and use it to pay the change of all the locks in the property. Perfect Villa - Perfect Location - Perfect Owners! We have stayed here once before, and found everything to be perfect, and so my wife and I decided to return with our two children. Firstly, we had an awful drive through France and arrived at the villa 5 hours later than we expected - Dolors was patiently waiting when we arrived having been there all day, and even offered to do some shopping for us whilst we were still driving, as the following day was Sunday and the shops would be shut. Thank you Dolors! The villa itself is extremely well equipped, all the bedrooms have comfortable beds with plenty of bedding and towels provided. The kitchen is lovely and perfect for cooking for family and friends if, for some reason, you don't want to go out into Girona. There is a lovely barbecue outside also. The pool is fantastic, we had such a wonderful time and spent a large part of every day lounging around the pool in the sun, or playing in the pool cooling off! Wonderful for kids - our 6 year old could not swim very well prior to our holiday, but after plenty of training each day she is now a professional! She absolutely loved the villa and the pool. There is also a garage area with games and plenty of space for kids to play out of the sun - it turned into a play room during our stay if the sun was too strong in the middle of the day. So, the villa is absolutely perfect, and can easily accommodate 10 people (5 couples) or two large families - the more the merrier! We spent many evenings sitting in the heat watching the sun set behind the mountains, and chatting and drinking on the balcony long into the night - perfect. The location is great, Girona is one of the nicest cities I have visited, lovely people, great history and culture, amazing restaurants - we spent almost every evening in Plaça Independencia, it has a wonderful atmosphere at night, and some of the restaurants serve amazing food, the tapas is delicious! Not only that, but Girona is home the the 'best restaurant in the world' as voted by the Michelin Guide - well worth a visit. There is plenty to do in Girona, Escapis was great fun, the castle and the road train tour are a must. All in all an amazing place to visit. There are plenty of nearby beaches also, we visited Platja de Castell, a wonderfully untouched beach, no buildings, perfectly clear water - beautiful. All in all, we would consider Girona is a remarkable place to visit, and this villa is the most perfect place to live and explore. La casa es confortable, con muy buena calefacción y acondicionada. Perfecta para un grupo numeroso de personas. Equipamiento en la planta baja para pasar buenos ratos de ocio. Futbolin, billar Americano, mesa de Ping Pong. maquinas de gimnasia. etc. Pudimos hacer barbacoa, todo y siendo 31 de Diciembre por la noche sin pasar frío. Rosa la Anfitriona de la Casa es muy amable y servicial, disponible en cualquier momento para lo que necesitáramos. Intentaremos volver en otra ocasión. Moltíssimes gràcies per triar la nostra casa per celebrar el cap d’any. Ens alegrem que us sentíssiu a gust i que poguéssiu gaudir de la barbacoa. La veritat és que que aquest Nadal va fer un temps excepcional, que convidava a estar fora. Sou uns hostes excel·lents. Esperem tornar-vos a veure algun dia. Muchísimas gracias por escoger nuestra casa para celebrar el fin de año. Nos alegramos que os sintierais a gusto y que pudierais disfrutar de la barbacoa. La verdad es que estas navidades hizo un tiempo excepcional, que invitaba a estar fuera. Sois unos huéspedes excelentes. Esperamos volver a veros algún día. Thank you very much for choosing our house to spend New Year’s. We are happy to see that you felt like home and that you could enjoy the barbecue. Truth is that this Christmas the weather was really exceptional, and it was a pleasure to be outside. You are excellent guests. We hope to see you again some day. Wij zaten met twee gezinnen in het huis (kinderen in de leeftijd van 5-11 jaar) en hebben een geweldige week gehad. Alles in het huis is aanwezig, mooi zwembad, goede airco in het huis, verschillende terassen, buitenbarbeque, enz. We waren vooral onder de indruk van de garage met allerlei speelvoorzieningen (van 'ringen' tot poolbiljart en van fitnessapparaat tot tafeltennistafel). Girona is met de auto prima te bereiken in nog geen 10 minuten. De eigenaar was heel behulpzaam, bij vragen kregen we meteen antwoord of kwam ze even naar het huis om te laten zien hoe iets werkte. From Girona Airport: take N-II North direction France. Take 2nd indicator for Quart (with gas station sign). Pass the entire village. Find villa (salmon colored) on the right side. Bikes to rent: in Quart, only weekends.